As the summer fades away, Fall reveals its true unique beauty by turning the entire world into one big canvas with nature’s paintbrush and making it look phenomenal in a sweet woody air. It is a special time of the year for everyone to get ready for upcoming festivals and holidays. However, with YouNetCo, we truly want you to make it happen now. 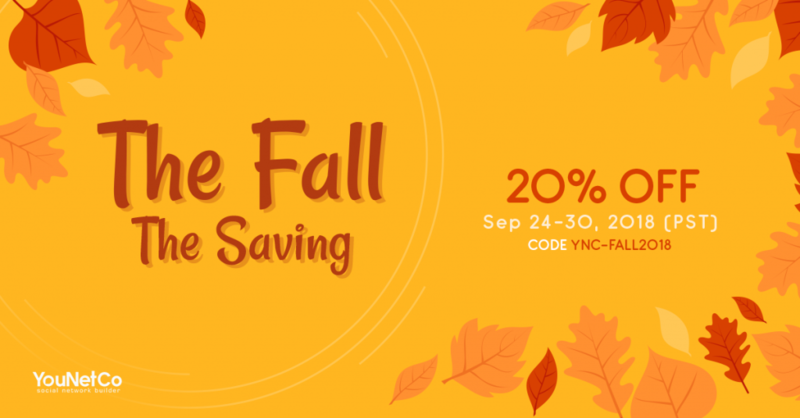 We gladly offer you 20% OFF on ANY products and packages purchased on phpFox Store from Sep 24, 2018 to Sep 30, 2018 (PST) . Please use the code YNC-FALL2018 upon checking out. Let celebrate the season of love and romanticism, and don’t miss out to save big on our Fall Saving Promotion! With the heat retracting, it’s the perfect time to step outside to embrace the beautiful sights, sounds, and the scent of Fall. Now that you know why you should fall in love with the season as we do. Make the changing season as an excuse to revamp with new goals, get inspired and inspire others!